Native to China and South and Southeast Asia, where it has been cultivated for over 4,000 years, the tea leaf plant (Camellia sinensis) not only offers a soothing scent and a delicate flavor, but it also has major health benefits, many of them corroborated by modern science. Truly one of the ancient wonders of herbal medicine, the tea plant, also called common tea or true tea, is the source of white tea, green tea, black tea, oolong, and pu-erh - all of which go through distinct processes in order to attain different levels of oxidation - and it has been a vital source of nutritional value for thousands of years. Its soothingly aromatic taste has been well-loved from the beginning, but modern science has also proven its lasting efficacy against a wide array of diseases. Increasing energy levels. 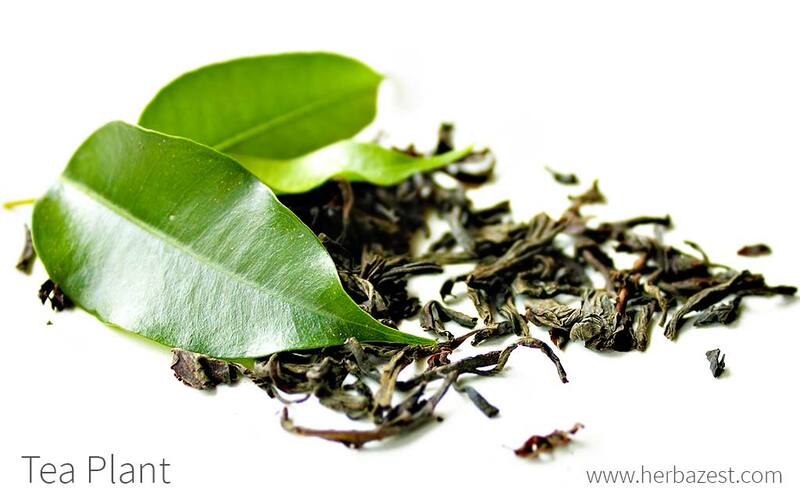 The leaves of the tea plant are popularly consumed due to their stimulant properties. Enhancing immunity. 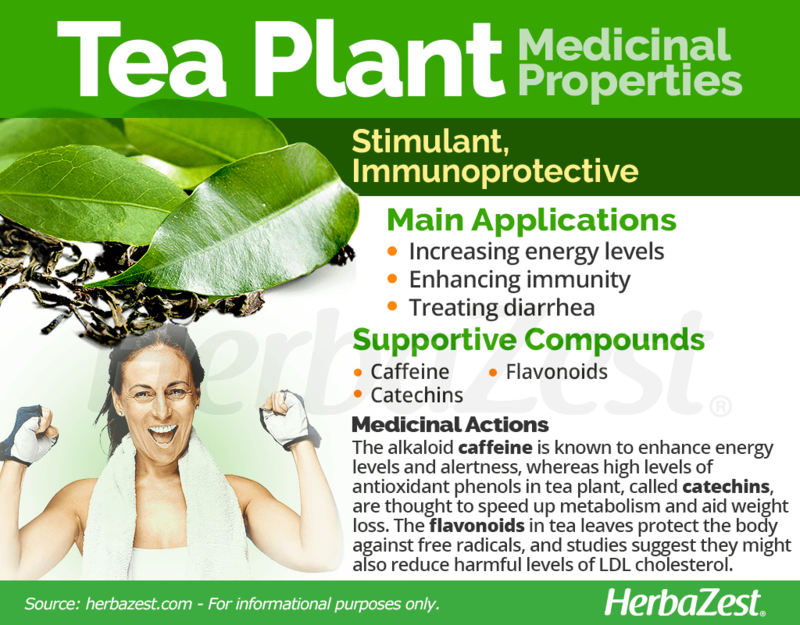 The tea plant is regarded as one of the most powerful antioxidant herbs. Due to a high concentration of flavonoids, tea has been suggested to have immunoprotective and anti-aging properties. Treating diarrhea. Tea leaves have antibacterial and astringent properties that help relieve dysentery and other digestive disturbances. Additionally, tea leaves are commonly used to relieve neuralgic headaches and have also been shown to lower LDL cholesterol (“bad cholesterol”) levels. Although not firmly proven, studies suggest that they may also promote weight loss. The tea plant contains the alkaloid caffeine, which was once thought to be a unique compound called “theine.” Caffeine is known to enhance energy levels and produce alertness because it blocks adenosine receptors in the brain, therefore preventing fatigue and sluggishness. Moreover, the tea plant boasts antioxidant phenols, called catechins, which are thought to speed up metabolism. Although not conclusive, studies suggest that these catechins, together with caffeine's mild diuretic action, may help with weight loss. Finally, the flavonoids contained in tea leaves can protect the body against free radicals, and they also seem able to reduce levels of LDL, or "bad" cholesterol. 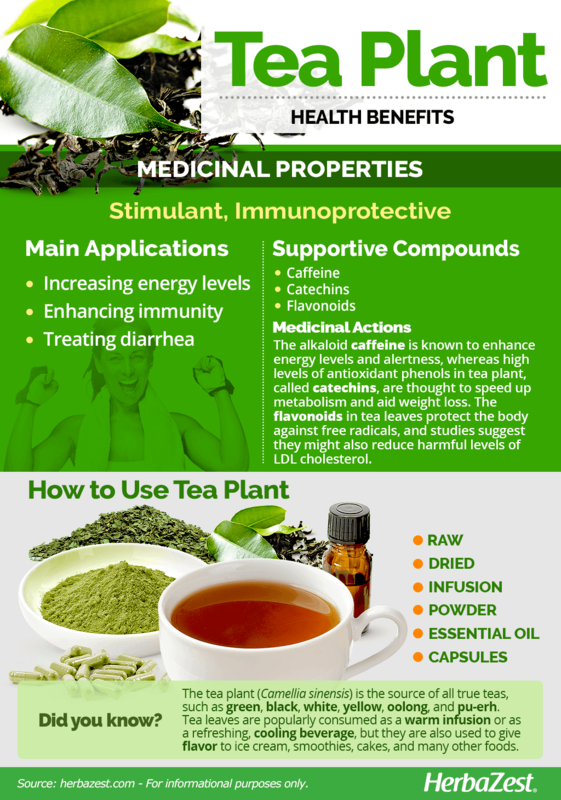 MOST OF THE NEW MEDICINAL APPLICATIONS OF TEA CAN BE ATTRIBUTED TO CATECHINS. An active compound in Camellia sinensis, theophylline, has been traditionally used as a bronchodilator agent in the treatment of respiratory illnesses, such as asthma; however, its use in pharmaceuticals was banned by the FDA in 1995. Coffee and guarana also have stimulant properties, and similar immunoprotective benefits can be found in herbs like echinacea and ginkgo. When consumed in moderation, tea is likely safe in virtually all of its forms. However, it can cause upset stomach and, in rare cases, liver damage due to its caffeine content. Other potential side effects can include headaches, nausea, irregular heartbeat, and dizziness. While consuming tea is generally safe, there are precautions some individuals should take. For those with an irregular heartbeat or who have high blood pressure, consumption of tea should be limited because of its caffeine content. For these reasons, individuals who suffer from bleeding disorders or who are using anticoagulant medications should exercise caution when consuming tea, since it can increase the risk of bleeding. While it is possibly safe for women who are pregnant and breastfeeding, overconsumption of tea, in any of its forms, can be unsafe due to its caffeine levels. Women who are pregnant or breastfeeding should not drink more than two cups of tea per day. Perhaps one of the most popular aromatic herbs in the world, tea is consumed in a number of different ways. Whether is green, black, white, or oolong, tea is not only consumed as a warm infusion or a refreshing, cooling beverage, but is also used to flavor a variety of foods, such as ice cream, smoothies, and cakes. However, virtually all of tea's health benefits are reaped from its medicinal forms. Raw. The spectacular aroma of fresh tea leaves can be transferred to any food, such as in a tea-wrapped salmon. In Asia, young tea buds and leaves are often used in salads and many other culinary delicacies. Dried. When brewed, the dried tea leaves can be used as a medium to poach fruits, as well as a replacement for water in soups, pizza dough, cakes, and more, in order to add the aromatic flavor and health benefits of tea. Infusion. When brewed, due to its catechin content, the leaves of tea can help treat a number of conditions, from gastrointestinal issues and headaches to high cholesterol. However, tea infusions are widely consumed because of their energy-boosting properties. Powder. Once finely ground, the young tea leaves are popularly known as 'matcha tea' or 'green tea powder', and can be used in a variety of sweet and savory recipes. Green tea powder is particularly high in catechins, which aids in lowering bad cholesterol and weight loss. For centuries, steeping fresh or dried tea leaves in hot water has been the most popular way of consuming tea plant, so much that the name tea has become a moniker for any herbal infusion. Essential oil. Used for its antioxidant properties, tea essential oil, when consumed in small quantities, is believed to aid weight loss, especially when used in salad dressings or for sautéing vegetables. When used for aromatherapy, it can increase energy. Capsules. 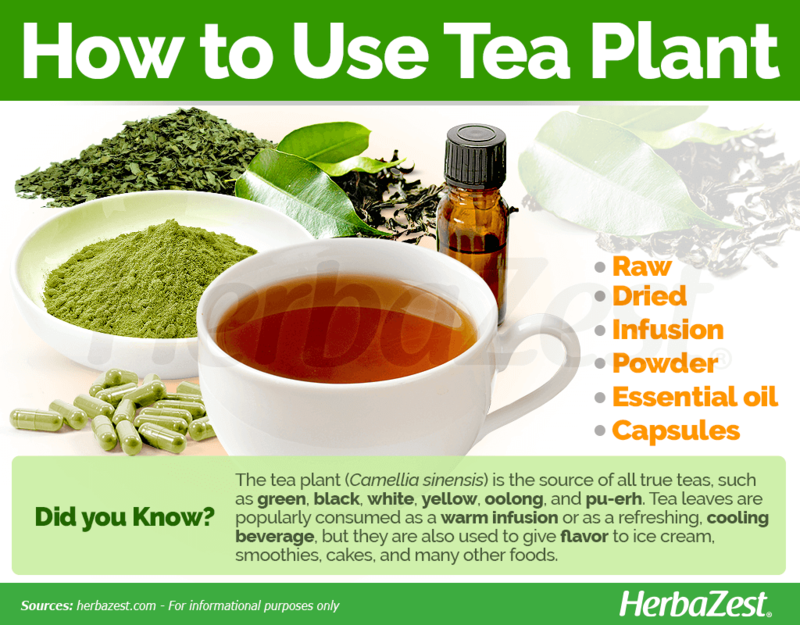 When taken as a capsule, tea is an incredibly potent stimulant, often used for its high catechin and caffeine content. Because of these properties, capsules are thought to aid weight loss. Tea plants can be found at many garden nurseries, and dried tea leaves, both in bulk and packed in individual bags, are regular fare in grocery stores, supermarkets, and health food stores alike. Some especially aromatic varieties of tea can be found online. Other forms of tea - such as tea oil, which is made from the herb's flowers and seeds, as well as tea capsules - are easier to find in specialized herbal stores and through online retailers. Although the tea bush grows best in tropical areas, it has been adapted to be commercially cultivated in much cooler, temperate regions, as far north as the United Kingdom. Tea plants require partial shade and an ample water supply in order to grow properly. The tea bush should be grown at high altitudes at least 5,000 feet (1,500 m) above sea level in order to slow down growth and imbibe maximum flavor into the leaves. Tea plants prefer loamy soils, with an ideal pH of 5.6 - 6.5. If left undisturbed, Camellia sinensis tea bushes will grow up to the height of a tree, so pruning is a must for harvesting ease. It's best to plant tea 10 - 15 feet (3.0 - 4.6 m) away from other plants to allow room for the bush to grow. More detailed information about growing tea plant can be found in the herb garden section. The tea plant is an evergreen that can grow up to 52 feet (16 m) tall, but it is usually trimmed to below seven feet (2 m) high for harvesting. While the leaves are its most harvested part, the true tea plant also produces yellow-white flowers and seeds that are used to make tea oil for seasoning or cooking. As a member of the Theaceae family, Camellia sinensis is one of several flowering plants used in Asia that is included among true teas. The genus Camellia comprises over 260 species - the most economically important being Camellia sinensis and Camellia japonica - in addition to an increasing number of interspecies hybrids, including evergreen ornamental shrubs and trees. There are three main varieties of tea plant: C. sinensis var. sinensis (Chinese tea), C. sinensis var. assamica (Assam or Indian tea), and C. sinensis var. cambody (Java tea). Each of these varieties has many subdivisions, which has lead to the creation of countless cultivars. Less known subspecies are C. sinensis pubilimba and C. sinensis dehungensis, which can also be found throughout Asian regions, and are more often used locally. Native to South and Southeast Asia, the tea plant's roots run deep in human history. The earliest preparations took place in China over 4,000 years ago, where the aristocracy - the only group that could afford to consume tea regularly - drank the herb prepared as an infusion to improve mental and physical functions. Tea continued to be a status symbol until the 12th century, when both the Mongolian Empire and tea prices fell. Meanwhile, the beverage gained great popularity in Japan as early as 800 BCE, and the herb finally made it to Europe in 1606. The 1940s saw its introduction in the United States, and worldwide consumption grows each year. Large-scale cultivation of the tea plant is an incredibly important industry in several Asian countries, none more so than China, who leads production of the plant with 780,000 tons each year. This represents 80% of the world's supply, followed by Japan with 10% of the remaining total. India, Vietnam and Indonesia also contribute to global tea production, especially since recent publicity of tea's antioxidant content has spiked overall demand. The tea plant has not only been considered very useful in Chinese Traditional Medicine (TCM) for millennia, but it is still an important aspect of many different cultures worldwide. In China, green tea is used for Gong Fu, a type of elaborate tea ceremony similar to the well-known Japanese tea ceremony. In Gong Fu, the tea is poured in a number of artistic manners, and the “tea master” is considered an artist in their own right. Skin care. Placing teabags of these processed leaves on the eyes is a popular home remedy for reducing puffiness. Cosmetics. Camellia sinensis extract is used in a variety of cosmetic preparations, including, tonics, moisturizers, and anti-cellulite products. Gardening. Like many other members of the Theaceae family, Camellia sinensis tea plant is a cherished ornamental bush that grows beautiful, glossy leaves and fragrant flowers. Additional uses. Tea leaves have also been used to clean carpets and fertilize plants.